2011 Global Manage Print Conference - DOTC "Great Expectations"
The North American MPS Conference, Orlando, May 2-4 2011. This will be the third MPS conference, the last two held in San Antonio, TX - "Remember the Alamo". I believe at the first conference, 140 or so folks attended. Last year, nearly double that. 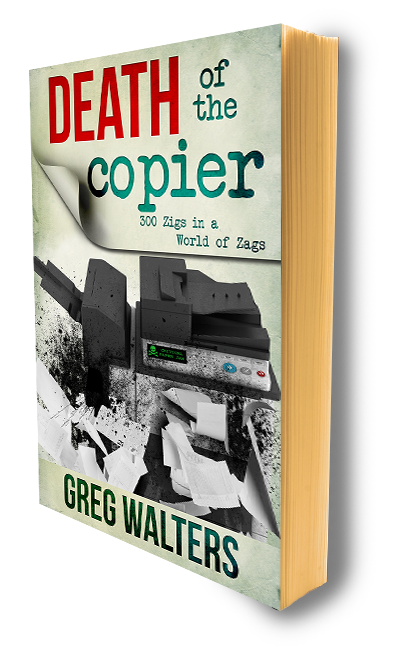 Three years ago, if one were to Google "managed print services" two or three names would come up, Photizo, TheDeathOfTheCopier, and ChangeForge. The other day, reports (in2) say that "managed print services" was searched 550,000 times last month on Google. It seems everybody is into MPS, and almost impossible to believe, the MPS buzz is bigger then ever. This year's show will be the biggest. More attendees and presentations. The planners vet every single presentation, trimming out the sales pitches resulting in more educational content. Five Tracks chuck full of examples, current best practices, stories of turmoil and of conquest. MPS heavy hitters, names everyone recognizes, will be presenting, attending and hanging out at the sponsored watering holes. Current Managed Print Services ecosystem, indeed, visionaries of the MPS yet to come(getting rid of the "P") will be here to hob-nob, commiserate and otherwise "nerd-out" - like a bunch of Trekkers no doubt. And we will cure all that ails, on the back of a napkin. What's up for the next three year? I expect the feel of the show to be less 'giddy', a bit more focused, secure - everything we felt 2 years ago was right.